BeejiveIM and IM+ are pretty cool multi-IM protocol iphone apps, both with push notifications support. But they have a great flaw - no support for group chat, meaning you can´t chat with 2 or more of your friends at same time. Well, i´ve just tested an excelent option for people seeking for this kind of app: OneTeam. Better, it works on wifi networks behind proxy servers, something Beejive does not do (IM+ does). Also, the price is competitive (4,99 euros). 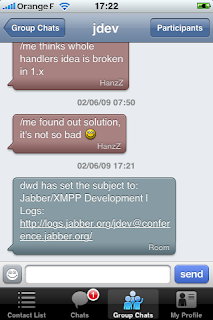 It´s also an multi-IM protocol client (yahoo, google, MSN, etc), but i prefered to create a oneteam jabber account just to have group chats with my iphone owning friends, and keep msn, etc, in Beejive. Group mode works through the creation of chatrooms, that can be protected with a password. Something cool, is that group chat also supports push notifications!